Yes, you. I am talking to you. Yes, keep shunning that make up. You really don’t need to be perfecting your skin and eye lashes all the time. You love rubbing your eyes when you’re tired. There’s no compulsion to put on the kohl, if you don’t like it. Yes, I am talking to you too. You don’t have to be in line for the protein shakes, gym memberships and the energy drinks! Go for a run instead. Or that long walk with your friend. You don’t really want a girl who only falls for your brawn and not your brain, do you? So what if she doesn’t have the most beautiful face around. She will have a beautiful soul, for sure. You believe that, don’t you? Say what you have in your mind. People will call you bold, aggressive, bossy, too ahead of your times and innumerable other things! But keep voicing your opinions. They’re yours. And remember, if you choose to remain mum, there’ll be others who’ll label you as weak, shy, introvert, or worse still dumb. You don’t want that, do you? You don’t like swooning over celebrities or watching and re-watching their films? Well, then don’t. You haven’t had a crush on any film or telly star? There’s nothing wrong with it. You don’t have to run with the crowd after them. You want to sit at the lunch table with that shy female from work or that gawky guy at school because you don’t want them to feel any more lonely than they already are? Well, go for it. Make them smile. Ignore those whispers and looks. You don’t want to back-b*tch about your boss or your superior or teacher, do you? It’s alright to stand up for them! Don’t let the back-b*tchers make you think otherwise. You’re a far better person than the back b*tchers, at least. You admire your friend for her courage, her determination, her optimism? It’s okay to tell her you are inspired. You may be a beacon for her in the world’s bleakness. 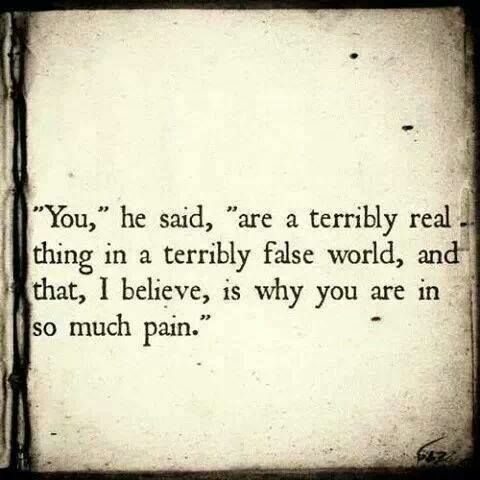 You are terribly real but that isn’t a terrible thing to be! The pain will wither away. If you keep being real, you’ll soon find innumerable moments of happiness dragging you away from those instances of pain. That pain is a part of your experiences. It has etched you, moulded you and refined you today. Don’t hate the pain. Keep being yourself. Yet don’t let the pain consume you. Let it go before it keeps you from being you.